I don’t really find words rich enough to describe this day up to the mountain Väretsfjället close to Tärnaby and Mittibäcken. 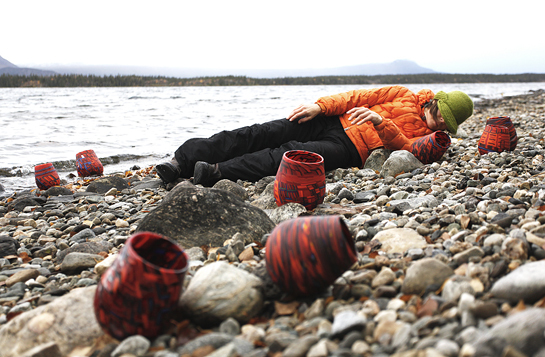 The aim of the day on the 15th of February 2013 was to bring 36 glass vessels and dancer and choreographer Carmen Olsson on two snowmobiles up onto the mountain, so Carmen could get a day in the snow to explore movements and dance with the vessels of glass. The weather was in a way exactly as I wanted; not too cold, not too windy and not too sunny. A whiteout in the morning so Carmen could experience the feeling of travelling in this white vast landscape where the only reference points were ourselves and the snowmobiles. Then – when everything was setup and Carmen worked most intensively – this opening up of the sky with a visable sun, now looking like a moon, peeking through the clouds. A kind of natures own performance forming the most beautiful backdrop a dancer could ask for. So I go from clarity to certainty that 100 MIGRATORY really wants to be. Most of the logistics was organised through Oskar Östergren, who was filming that day for his and Hijvens project 8 seasons – 8 films and all images here is by photographer Mikael Rutberg who also came with us on behalf of the Museum of Västerbotten. …it was the first day in my life I had warm freshly roasted almonds over an open fire up on the mountain – thanks to Carmen. A day to keep in my heart forever. The first week of October Ricklundgården was the home of dance and glass. Dancer and choreographer Carmen Olsson (Norrlandsoperan) met glass artist Monica L Edmondson – to get an understanding of the thoughts and feelings behind and within Monica´s art project 100 MIGRATORY. Carmen started her work to interpret and reflect on 100 M in movements and dance. You can experience the final result of the collaboration in a dance performance at the Museum of Västerbotten in winter 2014 as part of Rock Art in Sápmi and Umeå 2014 –the European Capital of Culture. 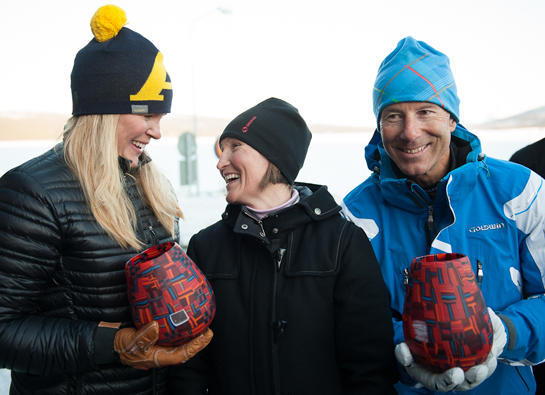 It was the night of the nights in Tärnaby with the visit of the World Champion alpine skiers Anja Pärson and Ingemar Stenmark at the opening of the international alpine races Ingemartrofén. It was a top opportunity for the worlds most successful ski club Tärna IK Fjällvinden, together with the local business alliance called PR-föreningen, to say thank you and good luck to Anja Pärson in her future persuits. She recently retired from professional alpine racing. The club and the business alliance gave one of the hundred vessels (part of the art project 100 MIGRATORY) as a thank you gift to both Anja and Ingemar. Anja is now the owner of no. 61/100 M ( 19 world championship medals plus 42 gold medals in World Cup races). Ingemar Stenmark recieved no. 86/100M ( he won 86 World Cup races during his career). However, they can take ownership of their glass vessels first after the final exhibition of 100 MIGRATORY in 2014, as the vessels have yet some world-wide journeys to undertake before then.